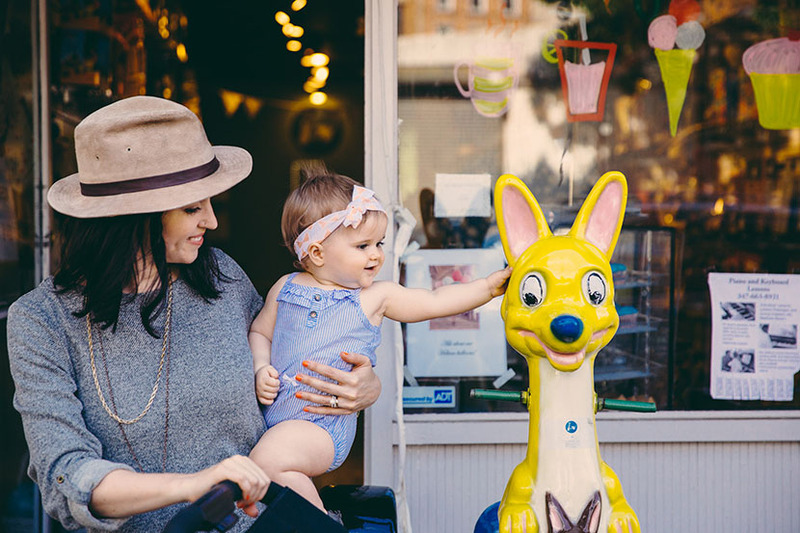 Recently, I gave a little tour of my neighborhood over on the Little Hip Squeaks blog as a guide to any mamas looking to find the best spots to explore with a little one in tow. Having traveled with Parker a bit, I quickly learned that not everywhere is best to bring her along. Some places you feel like the biggest jerk trying to squeeze your stroller into the narrow walk ways, or the tables are just too close together and your daughter is literally eating off the plate of the person next to you. Then there's always the lovely death glares from the employees when your child even makes the smallest peep. Oh yes, surprise..... children makes noises. It's so helpful to know in advance if a restaurant is accommodating for kids, if there is a place to store the stroller, the nearby spot I grab an extra soothie if she has gifted hers to the slobbery dog that just ran by. As a parent, you have to take your wins where you can. In case you missed it, here is the run down! Our neighborhood of Prospect Heights is nestled in a prime spot of Brooklyn. We are just blocks from Prospect Park, The Brooklyn Museum, the Botanical Gardens and an easy 15min subway ride over the bridge and into the city. Over the past few years since we've lived here, the food and bar options have really stepped up their game. Vanderbilt is quite the happening strip and pretty soon, it's likely we won't be able to afford to eat out anywhere in our neighborhood. And that, ladies and gentlemen, is when you know you live in Brooklyn. AMPLE HILLS :: It has only been voted like the best ice cream on planet earth by nearly every top critic there can be. Three words - salted crack caramel. R&D FOODS :: After opening the main restaurant, 606 R&D two store fronts down, this new little takeout and grocery joint carries a knockout selection of artisanal cheese, sandwiches and carries the best cup of coffee around from Brooklyn Roasting Company. Grab a snack and belly up to their window counter. SUNSHINE CO :: This corner restaurant was opened by the same peeps as the nearby coffee shop, Milk Bar. Their brunch menu is the talk of the town right now and it makes bringing the tot along pretty easy. They are patient with kids and have space for strollers and high chairs. WASHINGTON COMMONS :: They don’t fool around with outdoor space here! The backyard is giant and on any given weekend you will see a number of other parents with their children hanging out and drinking a beverage. BROOKLYN CREPE :: Get your daily dose of greens and fresh salad at this local juice bar. Parker’s favorite is the kale, apple and spinach. How cliche ‘Brooklyn’ of her, right? GRAND ARMY FARMER’S MARKET :: Nothing is better than starting off a Saturday morning at the local farmer’s market. They have all the seasonal veggies and fruits, fresh bread, flowers, coffee and you can always count on some local marmalade samples! :: It’s no Natural History Museum, but it does have a constant flow of jaw dropping exhibits for both parents and kids. Favorites include the sculpture garden and the Jean Paul Gaultier exhibit from earlier this year. Don’t be fooled, the admission price is merely a ‘suggested donation’. I have definitely given them a $5.00 bill without apologizing. Knowing my kid could have a meltdown at any moment, I will not be left feeling guilty for forking over a good chunk of change to only have to rush through the museum! having opened it’s doors in February 1, 1941, the building’s unique architecture was created to resemble an open book, with the spine on Grand Army Plaza and the two wings opening like pages onto Eastern Parkway and Flatbush Avenue. It hosts a great kids area to let them run and explore and read. Perfect refuge during during rainy, cold and wintery days. BOTANICAL GARDENS :: Seriously one of the more gorgeous places to visit in Brooklyn. Their Japanese gardens are stunning during cherry blossom season and you’ll enjoy the picturesque stroll through the massive lush grounds. You’ll have non-stop photo ops with the kiddos. Just drop them in some flowers and snap away! :: Grab a sandwich and snacks at R&D, bring along a bottle of wine (or apple juice!) and a blanket….. this is the easiest place to let the kids run wild while enjoying some time for yourself too. We love to gather our fellow friends with tiny people and let them all use it as if it’s their own backyard. BLUEBERRY KIDS :: This great new shop has all the knick knacks you need like last minute bibs and teething supplies, but also houses an indoor play area where your child can get all their energy out while you shop. Become a member, and they offer childcare and mommy cocktail nights…… now that’s what I’m talking about! 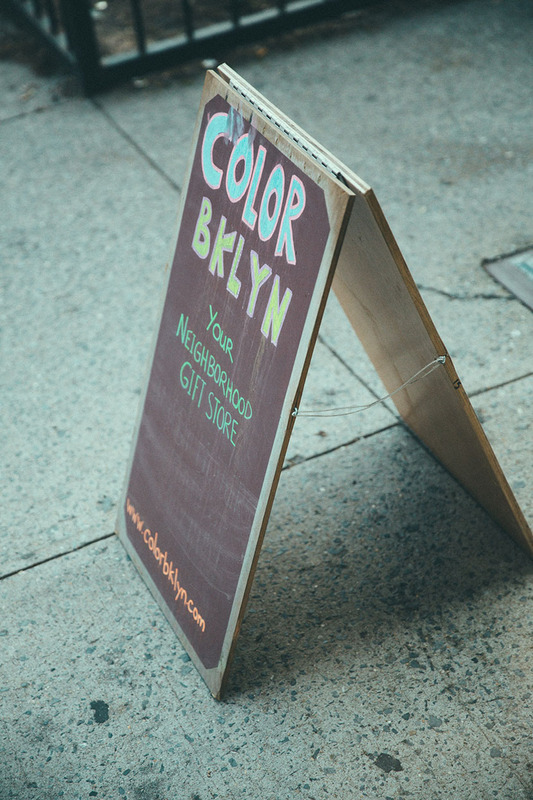 COLOR BKLYN :: Need a well curated gift or chic baby toy? This is your spot! These ladies know how to stock the shelves with beautifully designed and curated products. UNNAMABLE BOOKSTORE :: Our go-to bookstore. They have a darling children’s section and even have book readings in their backyard full of twinkle lights. Bonus - they have a $1, $3 and $5 book rack that sits out on the sidewalk. I’ve found many a gems in those racks before! We hope you come out and visit the neighborhood!